Elsewhere, distribution of The Way to Happiness in twenty-three languages for fifty nations, has proven equally dramatic. 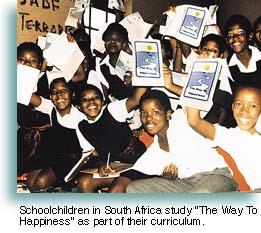 Introduced into a deeply troubled Colombia in the early 1990s, the booklet soon saw broad distribution through the efforts of national newspaper chains and the Minister of Education, who recommended The Way to Happiness to all Colombian educators, while simultaneously calling for his nations own "Set a Good Example" campaign. Next, came a Colombian military decree that thirty-thousand copies of the booklet be distributed to soldiers engaged in that nations civil disputes, and similar endorsements from government officials who saw the booklet as a catalyst for the elimination of bribery (then particularly rampant, what with the proliferation of cocaine cartels). Although immediate results may again be difficult to cite statistically, the sequence is plain enough. On the heels of The Way to Happiness campaign among schoolchildren, young students rallied to "Set a Good Example" with the burning of toy guns. Approximately ten weeks later, in what has been regarded as a remarkable statement of the booklets power, members of a previously warring M-19 guerrilla faction suddenly laid down their arms. Then came the coincident easing of racial violence in South Africa after 114,000 copies of the booklet had been distributed to that nations police force, and the similarly coincident decline in stadium violence after Italian sporting fans, as part of their campaign, saw to the distribution of the booklet at soccer matches. Finally, and not to presume more than the facts suggest, it was but two weeks after the dissemination of The Way to Happiness in Bosnia (where local newspapers reprinted the text for civilian and military personnel, and the booklet saw broad circulation among diplomatic channels) that three years of negotiations eventually came to fruition with a formal ending of hostilities. The point is, and regardless of how one wishes to interpret any single case presented here, The Way to Happiness has proven itself a potent force for peace and the reduction of criminality. 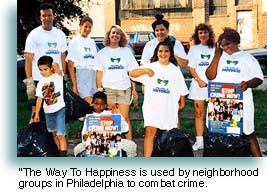 Moreover, as LRH himself predicted, the ensuing calm tends to "flow outward and outward," so that entire communities have noted a significant decline in crime rates with the adoption of The Way to Happiness by but one youth or community organization. In consequence, the booklet has received four United States Congressional recognitions and hundreds of similar recognitions from state and city bodies. Yet what is finally most important here, is what The Way to Happiness represents in terms of prevention  in terms of lifting of moral standards within young people before they fall to crime. If sufficiently distributed, LRH further remarked, this booklet alone could usher in a new dawn for mankind; and judging from what has thus far ensued with the first fifty million copies, he was correct  truthfully, demonstrably.